Yesterday evening Acer held its next@acer 2018 global press conference in New York. It showed off a wide range of products - from Chromebooks and PC accessories, to hulking powerful RGB gaming desktops and monitors. You can get an overview and watch videos of the event at the event homepage, linked above. The Acer Predator Orion 5000 Series gaming desktops feature up to 8th Gen Intel Core i7+ 8700K processors paired with the latest Intel Z370 chipset, up to 32GB of Intel Optane memory for fast load times and improved responsiveness, and up to 2-way Nvidia GeForce GTX 1080 Ti GPUs in SLI. With this potent blend of hardware at its disposal, Acer Marketing exec Steve Long insists that the Orion 5000 is the best gaming machine Acer has ever built. The tower is kept cool thanks to Acer's Ice Tunnel 2.0 technology. 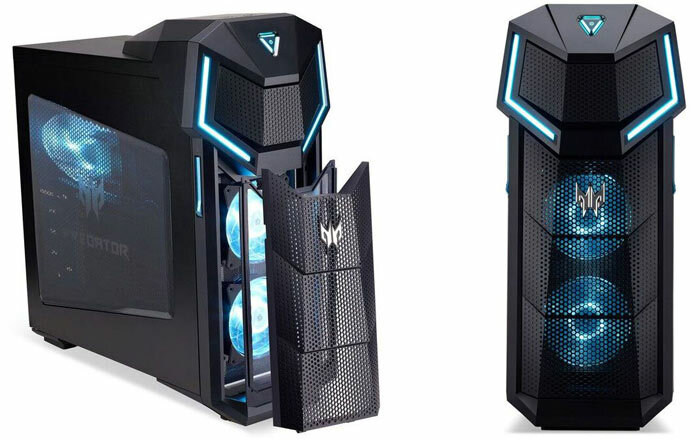 Acer Predator Orion 5000 gaming desktops will be available in North America in July starting at $1,499; in EMEA in June starting at €1,699. The Predator Orion 3000 Series from Acer is a little brother to the above machine - in stature and in component specs. Key specs are turned down a notch, tough it still comes with up to an 8th Gen Intel Core i7+ Processor, the single GeForce GTX 1080 top-end option is definitely a step down. This machine can come with up to 64GB RAM and up to a 512GB PCIe NVMe SSD. Acer Predator Orion 3000 gaming desktops will be available in North America in October starting at $999; in EMEA in July starting at €1,299. 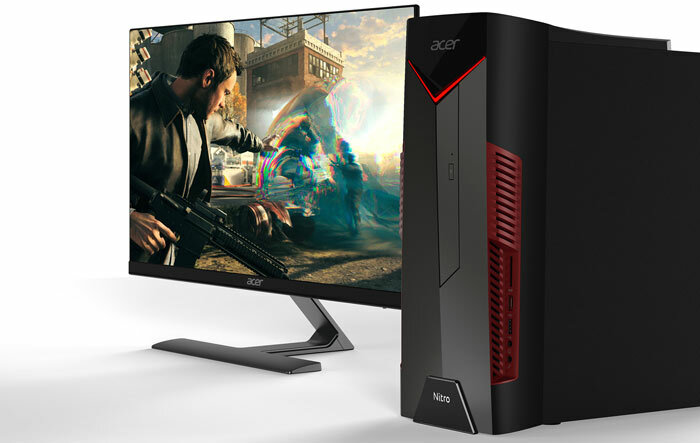 The Nitro 50 Series gaming desktops from Acer are more compact, less aggressively styled PCs. Buyers have the choice from up to an 8th Gen Intel Core i7+ or AMD Ryzen 7 processor. For graphics acceleration there is a choice between Nvidia's GeForce GTX 1070 and AMD's Radeon RX 580. Users can spec up to 64GB of RAM and up to a 3TB HDD and a 512GB SSD. Other attractive features of the Nitro 50 range are the fast gaming LAN support, and integrated Qi charger in the top of the chassis. The Acer Nitro 50 gaming desktops will be available in North America in July starting at $799; in EMEA in May starting at €999. If you are more interested in gaming laptops, Acer revealed its Predator Helios 500 and Predator Helios 300 Special Edition. The former machine is "a gaming beast," claims Acer and its top end specs include; up to overclockable 8th Gen Intel Core i9+ processors, up to 64GB RAM, and an overclockable Nvidia GeForce GTX 1070 graphics pushing pixels to its 4K UHD (or FHD) IPS 17.3-inch G-Sync display with 144Hz refresh rate. The Acer Predator Helios 500 is kept cool with two of Acer’s proprietary AeroBlade 3D metal fans, and five heat pipes. Other attractive features are its two speakers, a subwoofer, and Acer TrueHarmony and Waves MAXXAudio technology, dual Thunderbolt 3 ports, and a backlit RGB keyboard offers four lighting zones with support for up to 16.8 million colours. The Predator Helios 500 gaming notebooks will be available in North America in June starting at $1,999; in EMEA in May starting at €1,999. Acer's Predator Helios 300 Special Edition is more budget friendly and catches the eye with its chic all-white aluminium chassis accented with gold trim (see above). Built around a 15.6-inch FHD IPS display with a 144Hz refresh rate, this machine is powered by up to an 8th Gen Intel Core i7+ processor, overclockable GeForce GTX 1060 graphics, up to a 512GB PCIe Gen 3 NVMe solid state drive, and up to a 2TB hard disk drive. Buyers can spec up to 16GB of RAM (upgradable to 32GB). We don't have pricing and availability to share for this special edition laptop. Last but not least, Acer launched a series of new Predator accessories at the event last night. There was the new Predator Cestus 510 mouse, the Predator Aethon 500 extra-durable mechanical keyboard, Predator Gaming Chair, Predator Mousepad, and a gaming hard case to help you take your rig on the road. The front of the Orion looks like a bit of cheap cladding on a building. But I like the laptop and smaller desktop the design seems to flow better on those, rather than just simply bolt on to what is otherwise a rectangular box.